Reading and share top 7 famous quotes and sayings about Evangelicalism by famous authors and people. Browse top 7 famous quotes and sayings about Evangelicalism by most favorite authors. 1. "Between the scribe who has read and the prophet who has seen there is a difference as wide as the sea. We are today overrun with orthodox scribes, but the prophets, where are they? The hard voice of the scribe sounds over evangelicalism, but the Church waits for the tender voice of the saint who has penetrated the veil and has gazed with inward eye upon the Wonder that is God. And yet, thus to penetrate, to push in sensitive living experience into the holy Presence, is a privilege open to every child of God." 2. 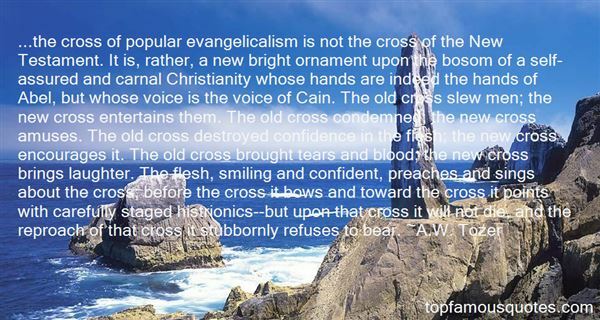 "...the cross of popular evangelicalism is not the cross of the New Testament. It is, rather, a new bright ornament upon the bosom of a self-assured and carnal Christianity whose hands are indeed the hands of Abel, but whose voice is the voice of Cain. The old cross slew men; the new cross entertains them. The old cross condemned; the new cross amuses. The old cross destroyed confidence in the flesh; the new cross encourages it. The old cross brought tears and blood; the new cross brings laughter. The flesh, smiling and confident, preaches and sings about the cross; before the cross it bows and toward the cross it points with carefully staged histrionics--but upon that cross it will not die, and the reproach of that cross it stubbornly refuses to bear." 3. "If I have so far argued that Foucault is a kind of closet liberal and thus deeply modern, I need to be equally critical of evangelical (and especially American) Christianity's modernity and its appropriation of Enlightenment notions of the autonomous self. Indeed, many otherwise orthodox Christians, who recoil at the notion of theological liberalism, have unwittingly adopted notions of freedom and autonomy that are liberal to the core. Averse to hierarchies and control, contemporary evangelicalism thrives on autonomy: the autonomy of the nondenominational church, at a macrocosmic level, and the autonomy of the individual Christian, at the microcosmic level. And it does not seem to me that the emerging church has changed much on this score; indeed, some elements of emergent spirituality are intensifications of this affirmation of autonomy and a laissez-faire attitude with respect to institutions." 4. "Evangelicalism as a movement is rushing headlong toward theological ambiguity, which is another way of saying apostasy." 5. "Far too many people, especially within evangelicalism, think that the individual is all that matters, and that the corporate dimension is a distraction or diversion. 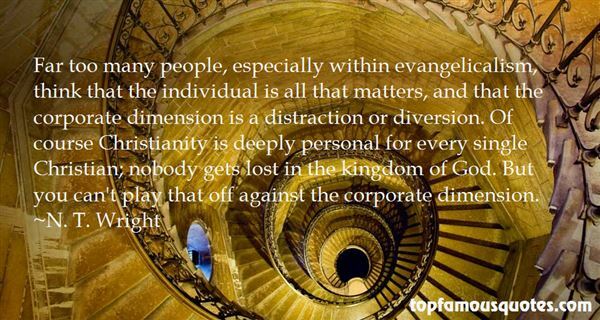 Of course Christianity is deeply personal for every single Christian; nobody gets lost in the kingdom of God. But you can't play that off against the corporate dimension." 6. "Being that 'reason is not antithetical to faith' (Woods) and that Pentecost established the Reality of super-nature (Lewis) and that 'theology matters' (Wimber), then 'empowered evangelicalism' (Nathan) is the natural expression of discipleship."~R. Alan Woods "
7. "The failure of modern evangelicalism is the failure to understand the holiness of God." In some sense, he said, a community was a giant collection of habits occurring among thousands of people that, depending on how they're influenced, could result in violence or peace."